Coastal Energy installs and maintains furnaces throughout the mid-island region including Nanaimo, Ladysmith, Cedar, Parksville and Qualicum Beach. We sell and service top quality brands including York, Goodman, Intertherm and Olsen-Airco and York® Affinity™ Series Furnaces. Deciding which furnace to purchase is similar to choosing other appliances for your home. Like any other home appliance, you’ll want a furnace that is reliable, innovative, and stylish. 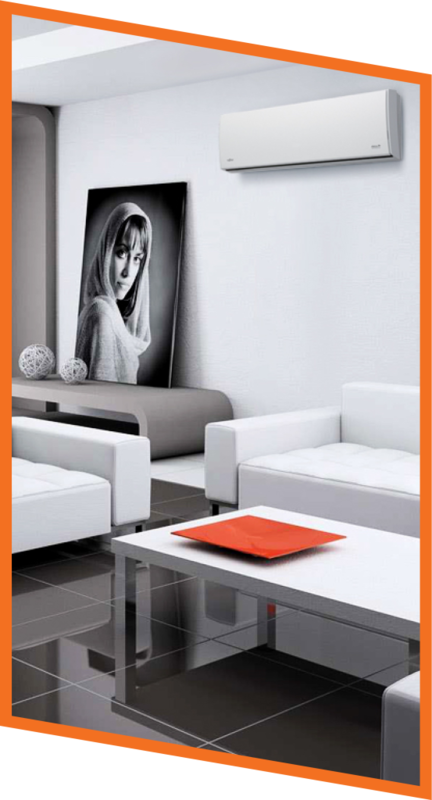 This series provides comfort and style, with lots of options to choose from. Comfort is about more than feeling the warmth through the winter. It’s also about peace of mind throughout the year. With over 140 years of experience heating family homes YORK® products deliver both. Are you familiar with Ductless Heat Pumps? There's actually one featured in this picture. Reduced consumption. You can reduce your use of electricity and improve the performance of your system by choosing models with ECM fan motors. ClimaTrak™ technology and our models that include a variable-speed ECM motors offer fine-tuned indoor climate control. Year-round value. 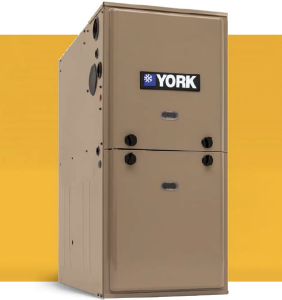 By adding an indoor coil from a YORK® split system to your existing furnace, you can have even greater all season flexibility. Personalized comfort. A two-stage gas furnace can track temperatures more accurately, shifting the performance level as required to provide you and your family with greater comfort. Precision construction. The reinforced cabinet door gaskets ensure that the warm air you’re paying to heat is quietly and efficiently delivered to where it’s needed. Intelligent engineering. Hot-surface ignition and 100% shutoff valve technology saves on fuel costs while increasing dependability and reliability. Efficient performance. An advanced, tubular aluminized steel primary heat exchanger allows for high heat transfer and outstanding efficiency. The Good Housekeeping Seal. This seal means you have the added assurance that York® furnaces have been tested for quality and reliability. It means they meet the standard that’s required to guarantee product replacement or refund of the purchase price if proven to be defective within two years of purchase date. Less is more. 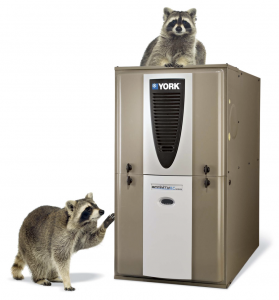 The power of a York® Furnace comes from one of the most compact cabinet designs in the industry. At just 33” high, upgrades are simplified as they easily fit into the existing space taking up less room space, lowering costs, and offering more heat and comfort. Customized Comfort With ClimaTrak™ Units that include ClimaTrak™ variable-speed air-handling technology can be customized to keep you comfortable in a dry, temperate, or humid climate. Our installers will set up an operation cycle that works best for you. Automatic Comfort Modulation. A modulating furnace automatically replaces the amount of heat leaving your home, adjusting to 50 or .65% increments. This maintains the temperature setting that you select within approximately half a degree. Peace of mind you can afford. 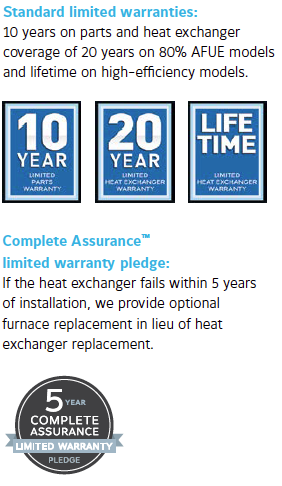 A 10-year limited warranty on parts is the standard warranty coverage on select York® systems when registered within 90 days of installation. We take pride in knowing YORK® home comfort systems are keeping our friends and neighbors comfortable in homes across the country. But we know comfort is more than just heating or cooling the air, so here are a few reasons you can be confident a YORK® heating system will provide your family with comfort and energy savings that last. 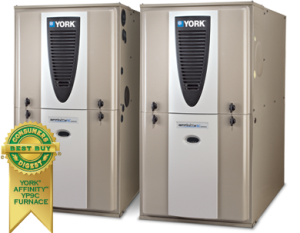 Advanced efficiency YORK® LX Series Gas Furnaces meet U.S. EPA energy efficiency standards, with select models qualifying as ENERGY STAR® products, and up to a 97% Annual Fuel Utilization Efficiency (AFUE) rating on our most efficient models. LoNox (nitrogen oxide) models are also available to meet specific code requirements. 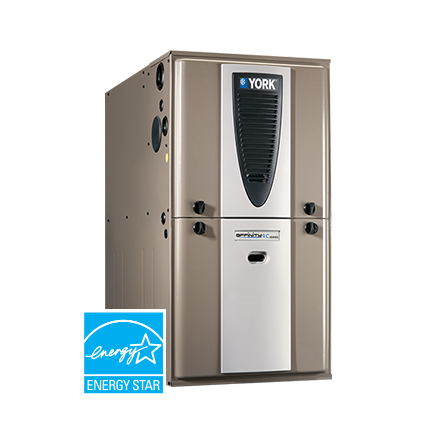 World-class quality Designed and built in North America, YORK® LX Series Gas Furnaces are crafted using state-of-the-art manufacturing techniques from Johnson Controls to provide world-class quality at competitive prices. Prestigious endorsements YORK® LX Series Gas Furnaces bearing the Good Housekeeping Seal are just another reminder of the quality that comes standard in every product we make. 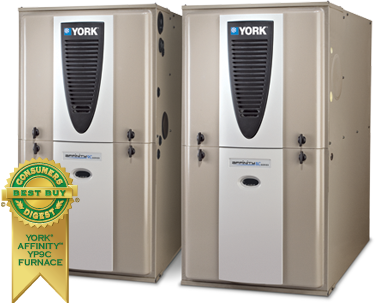 Hassle-free installation A wide range of YORK® LX Series Gas Furnaces ensures the right fit for every home. Compact cabinets fit in tight spaces, and since all LX Series Gas Furnaces come pre-assembled from the factory, set-up is quicker than ever. 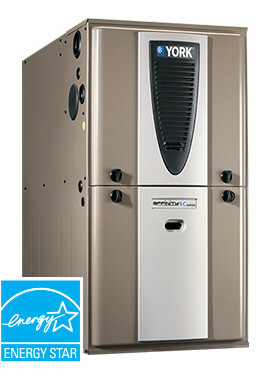 We are extremely happy with the electric furnace and the excellent service Coastal Energy provided both before purchase of the furnace and during installation. I found the whole process to be easy and pain free. We love the fact that it’s more of a continuous and stable heat source and generally quieter than the old oil furnace – it just magically seems to heat up the house! At the end of the day, the furnace you recommended was the right choice for our budget, heating needs and would highly recommend Coastal Energy to anyone looking to improve or replace their heating system! Last fall Paul and his team installed a Newmac wood/oil combination furnace in my home and I am delighted with the results. My new furnace is easy to use, quiet and extremely efficient. I love it ! There were many extra challenges involved in working in my older home and everything was handled professionally, politely and promptly. Paul carefully explained the entire process— from selecting the correct model right through to making sure I was comfortable with the controls. Paul and his team are dedicated to providing a high level of service and follow-up support to their customers. I highly recommend Coastal Energy for anyone’s heating needs.